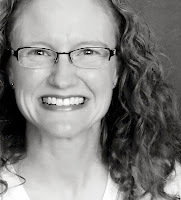 My Little Slice of Bliss: Purple Onion Designs to the Rescue! Happy Friday to you! I hope you had a fun Halloween yesterday. We managed to sneak in trick-or-treat between the rain showers, so I'd say it was a successful evening! Our freshman daughter threw me for a loop when she came home from school yesterday evening. She joined the high school's a cappella group this year and is having a blast. Tonight is their first performance, and she has been staying after school for extra practices all week long. So, yesterday she announces that, on Halloween when our family (and most likely many others just like ours) has plans for a busy evening, the director told them during practice, "By the way, you all need to bring baked goods with you tomorrow to sell during intermission at the performance." What?!?!? Who forgets to share this vital bit of participatory information until the night before the performance and then expects families to drop everything else--on Halloween!--to get ready for a bake sale? Well, apparently the high school music director!! Faced with the prospect of having no time to run out to the store for ingredients, I surveyed our meager stocks looking for inspiration for bake-sale ready goodies. Our prospects were not good. My daughter finally suggested caramel corn. Genius! A batch of caramel corn requires not much more than popping corn, butter, brown sugar, and corn syrup, which always seem to be in ready supply at our house. So while my husband and son headed out for trick-or-treat and my daughter costumed herself for treat distribution at our own front door, I slaved away in the kitchen doing my last-minute music-boostery duty of stirring oven-baked caramel corn. My next dilemma was how to package all this crunchy goodness for the bake sale. All I had were some standard fold-over sandwich baggies. Not terribly attractive. 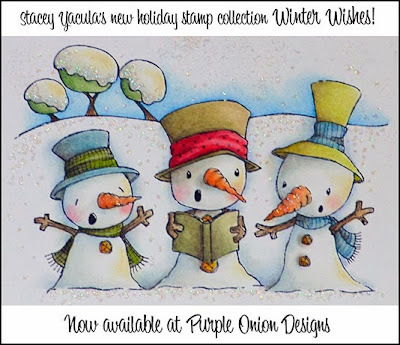 But then my Purple Onion Designs stamps came to the rescue! I was able to use one of their Treat Logo stamps and accompanying Treat Words to create some fun tags to dress up these bags in no time at all. Nothing fancy here (these bake-sale treats will be purchased and gobbled down in a matter of minutes, after all), but it's often a little extra like this that will attract a customer, right? I just love the huge variety of mix-and-match treat descriptions in the Treat Words set--like "peanutbutter" and "pretzels" and "fudge" and "snickerdoodles" and "clusters" and "chocolate" and "kisses" and, well, it goes on and on with a ton of options for creating custom titles for whatever goodies you are making. Love, LOVE that!! And speaking of Purple Onion Designs, the release of Stacey Yacula's adorable new holiday stamp collection Winter Wishes is live in the Purple Onion Designs store today! You can view the entire collection HERE. Purple Onion owner Michele is running a 25% off sale when you buy the entire collection. Sale ends November 7. Thanks for stopping by today. I hope you have a terrific weekend! WHAT!!!!?? That is not good a good thing. But, you came through in a fun way. Great tags with your Purple Onion stamps. Whew! I imagine that is just what you thought, too. Oh, look at those snowmen. You know you are tempting me as I love snowmen soooooo much. Yummy treats Emily!! And fun tags you made for them too! You are an awesome Mom! I love the tags on the treat bags and your popcorn balls look so yummy. Great save! But I bet there were a lot of flabbergasted parents when they heard that request! Oh man, there are no words fit for blogland in response to that situation. You're a better woman than I! These turned out adorably & look delicious!